1. Apply the parking brake, and block both rear wheels. Start the engine, and warm it up to normal operating temperature (the radiator fan comes on). 2. Shift to D while pressing the brake pedal. Press the accelerator pedal, and release it suddenly; the engine should not stall. 3. Repeat step 2 in ail shift lever positions. 4. Connect the HDS to the DLC (A) located under the driver's side of the dashboard. 5. Turn the ignition switch to ON (II), and go to the A/T Data List. Make sure the HDS communicates with the PCM. If it does not, go to the DLC circuit troubleshooting (see page 11-181). 6. Prepare the HDS to take a HIGH SPEED SNAPSHOT (refer to the HDS user's guide for more details if needed): -Select the High Speed icon. -Set the Trigger Type to Parameter. -Adjust the Parameter setting to APP Sensor A above 1.2 V.
-Set the recording time to 60 seconds. -Set the trigger point to вЂ”30 seconds. 7. Find a suitable level road. When you are ready to begin the test press OK on the HDS. 8. 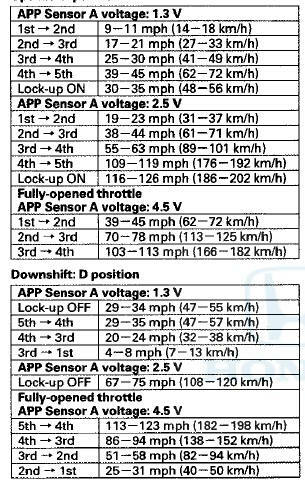 Monitor the HDS and accelerate quickly until the APP Sensor A reads 1.3 V. Maintain a steady throttle until the transmission shifts to 5th gear, then slow the vehicle and come to a stop. 9. Save the snapshot if the entire event was recorded or increase the recording time setting as necessary and repeat step 8. 10. Adjust the parameter setting to 2.4 V. Test-drive the vehicle again. 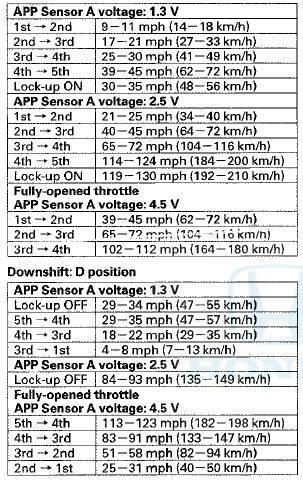 While monitoring the HDS, accelerate quickly until the APP Sensor A reads 2.5 V. Maintain a steady throttle until the transmission shifts to 5th gear (or reasonable speed), then slow the vehicle and come to a stop. 11. Save the snapshot if the entire event was recorded or increase the recording time setting as necessary and repeat step 10. 12. Accelerate quickly until the accelerator pedal is to the floor. Maintain a steady pedal until the transmission shifts to 3rd gear, then slow to a stop, and save the snapshot. 14. Drive the vehicle in 4th or 5th gear with the shift lever in D, then shift to 2. The vehicle should immediately begin to slow down from the engine braking. 15. Shift to 1, accelerate from a stop to full throttle, and check for abnormal noise and clutch slippage. Upshifts should not occur in this position. 16. Shift to 2, accelerate from a stop to full throttle, and check for abnormal noise and clutch slippage. Upshifts and downshifts should not occur in this position. 17. Shift to R, accelerate from a stop at full throttle momentarily, and check for abnormal noise and clutch slippage. 18. Park the vehicle on an upward slope (about 16-degrees), apply the brake, and shift into P. Release the brake; the vehicle should not move. NOTE: Always use the parking brake to hold the vehicle when stopped on an incline in gear. Depending on the grade of the incline, the vehicle could roll backwards if the brake is released.